who's Grandparents, Aunts and Uncles lived at Tollgate Farm which was within a few yards of the aerodrome. The book is no longer in circulation. The site of the airfield was on the field behind Tollgate Farm on the north side of the road just past the cross roads of Blind Lane and Church Lane (Welborne) on the road coming out of Mattishall heading to East Tuddenham. The first Zeppelin raid occurred on the night of 19th January 1915, when the L-3 carried out an attack on the undefended town of Great Yarmouth, dropping eight 110 lb high explosive bombs in a line across the built-up area and on South Denes. The two people killed in the attack were the first British citizens to die in an air raid. Later the same night the L-4 dropped bombs on King's Lynn, killing a woman and a child. To combat the ever-increasing German Zeppelin raids which were flying over England unchecked and terrorising the civilian population a decision was made by the War Office to build a line of airfields stretching from London to Hull, called the Home Defence Line. Mattishall was selected as it was in the centre of this defence line and the 80-acre field behind Tollgate Farm was chosen. The residents of Toll House Farm had no warning that an Airfield was going to be built on their field. The first indication was one morning when lorries and personnel arrived and started putting up tents quite close to the farm's back door. They constructed huts for officers as well as basic facilities such as latrines, bathsheds a generator for the water supply, hangers, workshops,stores and a cook house. The huts were sectional and were made by Boulton & Paul of Norwich. It must have been quite a hive of activity. The first aircraft flown from Mattishall was the (Bleriot Experimental) BE-2c often called the "Quirk" it was an updated version of the BE-2b with a modified engine for extra stability and the addition of an observer's Lewis machine gun. The BE-2c was Britain's attempt to cope with the superior German Fokker D-V11 and the menacing Zeppelins The pilots from The Home Defence Line had small hand held bombs that they would literally drop onto their targets. 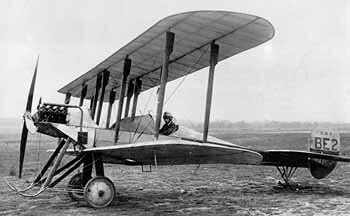 When the 38 Squadron was moved to France to fight on the western Front, they were replaced by 51 Squadron and the FE-2b biplane (Farman Experimental). Initially it was used for reconnaissance, the 2 seater biplane was armed with two or three .303 Lewis machine guns, the observer sat forward in the nacelle, directly in front of the pilot. An interesting and horrifying account is recorded by Frederick Libby the first American ace of World War 1, on his experience in the plane. "When you stood up to shoot all of you from the knees up was exposed to the elements. There was no belt to hold you. Only your grip on the gun and the sides of the nacelle stood between you and eternity. Towards the front of the nacelle was a hollow steel rod with a swivel mount to which the gun was anchored. This gun covered a huge field of fire forward. Between the observer and the pilot a second gun was mounted, for firing over the FE-2b's upper wing to protect the aircraft from rear attack.... Adjusting and shooting this gun required that you stand right up out of the nacelle with your feet on the nacelle coaming. You had nothing to worry about except being blown out of the aircraft by the blast of air or tossed out bodily if the pilot made a wrong move. There were no parachutes and no belts". These small aircraft were often taking off and landing in total darkness and patroling the night skies over Norfolk and its coastline.Often after flying at operational height, on landing the pilots had to be carried from their cockpits, which were completely open , suffering from intense cold. There were several accidents on and around the air field planes were frequently coming into land and finishing up on their nose. A Lieut Thunder crashed on the Mattishall side of Blind Lane and was immediately engulfed in flames. The pilot, injured and severely burnt,managed to crawl to the nearside bank. He was taken to the Norfolk and Norwich Hospital but was pronounced dead on arrival. Regular training flights were made between Mattishall and Marham, they would follow the Dereham - King's Lynn railway line. On Aug 5th 1918 the Germans attempted what was to become the last raid on England by a Zeppelin. The L-70 was hovering of the Norfolk coast, on board was Peter Strasser (pictured earlier with Count von Zeppelin) )when it was spotted by the crew of a Lightship. The Lightship radioed the information to Yarmouth and the signal was sent to the airfields. 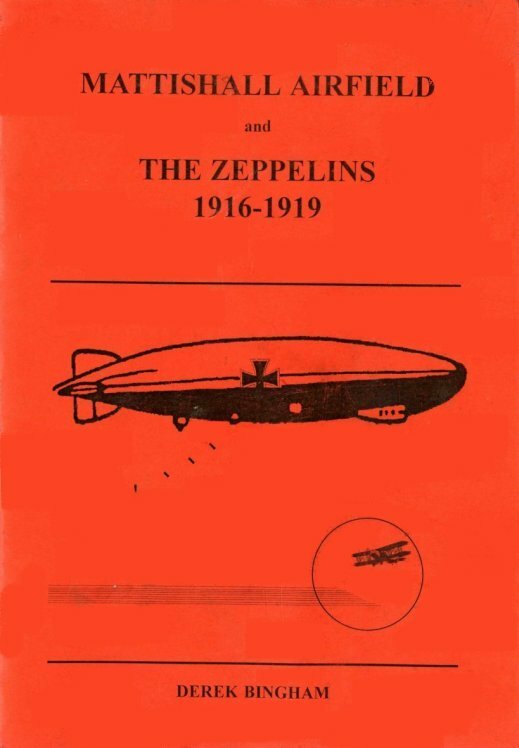 The L-70 was located by Major Egbert and Captain Leckie who attacked the Zeppelin with their incendiary bullets, the Zeppelin ignited and fell into the sea. There were no Survivors. The Armistice was signed eight months later and the First world War was over. Two of the giant German airships, L-64 and L-71 flew around Norwich during daylight they were on their way to Pulham Airship Station where they surrendered in accordance with the Armistice Agreement. It was reported that they were clearly seen from Mattishall. The airfield known as Mattishall Airfield, was situated mostly in East Tuddenham, with a smaller part in Mattishall and a much smaller part in Welborne. In 1916, Mattishall was a large village with plenty of shops, public houses and a large church situated on the Tuddenham side ofthe village. The church with its tower was a good landmark for pilots attempting to find the nearby airfield. The airfield was built after a decision by the War Office to build a line of airfields stretching from Hull to London, called the Home Defence Line, to combat the ever-increasing raids by German Zeppelins, which were flying over England with impunity and terrorising the civilian population. The massive Zeppelins, six times as long as Mattishall Church is high, had already been seen by villagers on starlit nights; and the noise from the airships' throbbing diesel engines was frequently heard. The reason why Mattishall was selected as part of the defence system, was because it was equidistant from Hull and London and in the centre of the line of defence. The site where the airfield was situated was a large 80-acre field behind Tollgate Farm, on the left-hand side of the road leading to Norwich and well-positioned for fighter aircraft to defend the centre area of Norfolk. The two other airfield sites in Norfolk were Marham and Great Yarmouth, the latter already a sea-plane base that had been built to provide protection for Britain's North Sea Fleet. This aerial defence system was built only twelve years after the first manned flight by American Orville Wright, on December 17th, 1903, at Kitty Hawk, North Carolina. At this time, my grandparents, aunts and uncles lived at Tollgate Farm and the first indication of an airfield being built was in early 1916, when lorries and personnel arrived one morning and started to erect tents within a few yards from the back door of the farmhouse. My grandmother asked what was going on and was told that an aerodrome was to be built in close proximity to the farm. Indignant, she insisted that they move further from the backdoor, which they did, selecting an area at the end of the farmhouse paddock. The 80-acre field, known as the Great Field, was short grass, having been previously used for sheep grazing. The shepherd was a Mr. Basey from East Tuddenham. The constructors used a Steam Roller (Number 4, driven by a Mr. Gambling) from Norwich Corporation, at Westwick Depot, to make a hard roadway onto the airfield and another roadway leading into the farm paddock. It was also used for general levelling work around the site. Arrival of No. 38 Squadron, R.F.C. The first aircraft flown from Mattishall Airfield belonged to the No. 38 Squadron, Royal Flying Corps, with one Flight at Mattishall, one at Marham and a third at Tydd St. Mary, near Wisbech in Lincolnshire. The aircraft flown by the squadron at this period, were very slow BE2c biplanes armed with a single Lewis gun and small bombs carried in the cockpit. The bombs were for dropping on the Zeppelin airships if it was possible. The airfield soon became operational with six biplanes and two mobile search-lights. The search-lights were sent out most nights and positioned at Honingham and Yaxham. The lights helped to deter the Zeppelins and also assisted the pilots in finding the airfield at the end of a night patrol. At first, the RFC personnel stationed at Mattishall Airfield were billeted in tents and local buildings: the lower ranks being in tents and the officers living at Mr. Eason's Green Farm and at Mrs. Claxton's Barrack Yard at East Tuddenham. A well was bored; latrines; ablutions; bath sheds; and two long wooden huts for officers were erected at the Mattishall side of the farm. Four similar huts were erected for the other ranks at the Tuddenham side. Behind the farmhouse, a hut called the Power House was built to house a generator to provide electricity and to pump water from the well. At the same time, a guard but was erected at the entrance to the farm paddock. Other huts for stores and cookhouse were built; as well as two hangers and workshops, all to high specifications. The huts were sectional and made at Boulton and Paul, Norwich. Arrival of No. 51 Squadron, R.F.C. Not long afterwards, No. 38 Squadron moved to France for operations on the Western Front and were replaced by No. 51 Squadron, operating FE 2b biplanes. These aircraft, were a "pusher" type, that is to say, the engine was fitted behind the pilot instead of at the front of the airframe. 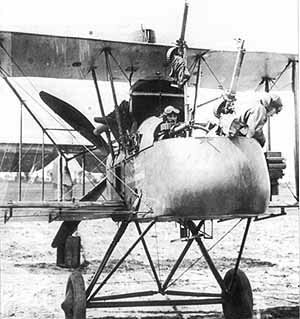 They were armed with two Lewis guns and had two cockpits, the gunner sitting in the front of the aircraft and the pilot sitting behind. The aircraft were just one type of many different aircraft made by Boulton and Paul at that time. The new squadron deployed 'A' Flight at Mattishall, 'B' Flight at Marham and 'C' Flight at Tydd St. Mary. Two cooks were employed - Beatty Basey from East Tuddenham and Frances Mack from Hockering. One other airmen's favourite meals was baked wild rabbit, which were easily obtained locally. The swill from the cookhouse helped to feed the pigs on the farm. On one occasion, when the clocks were put forward one hour, Frances forgot to alter her alarm clock and did not turn up to cook the men's breakfast at the allotted time. The airmen sent a dispatch rider to Hockering and brought her to the cookhouse through Blind Lane, sitting on the steel carrier on the back of his motorcycle, a rough ride indeed (Dispatch riders were constantly plying back and forth from Thetford, the area Head Quarters, with messages and orders). Some of the squadron officers had their own motorcycles and these were kept in the farm barn. A Levis and a Harley Davidson are two of the makes remembered. There were approximately fifty personnel at Mattishall Airfield, commanded by a Captain Powell. The C.O. was an enlightened man and when any of his men committed a misdemeanour they were punished by being given a number of hours working in the Camp garden. This ensured a good supply of fresh vegetables for the cookhouse. The German Zeppelins came over at night, so the squadron pilots had to take off and land in darkness, a hazardous operation. To assist them to pin-point the landing strip a flare-path of paraffin-soaked rags in oil drums were lit by one of the groundcrew running along the lines of drums with a lighted rag on a stick. Later, the airfield was illuminated at night by small portable searchlights. Accidents were frequent. On one occasion, a Lieut. Thunder crashed on the Mattishall side of Blind Lane and the plane was immediately engulfed in flames. The pilot, injured and severely burnt, managed to crawl to the nearside bank. He was taken to the Norfolk and Norwich Hospital but was unfortunately pronounced dead on arrival. Other crash sites were behind Burgh Farm and behind Crossroads Farm. These sites are either side of Welborne Church Lane. Accidents also happened on the Airfield, one plane coming into land finished completely upside down and others finished up on their nose. As the defences became more efficient the German Zeppelin crews became more wary and began flying higher in the night sky. On a number of occasions they made attempts to bomb the airfield but only one bomb out of several dropped actually landed on the field, the others landing close to the village. The personnel at the airfield were warned by telephone of impending raids, and they in turn notified my grandparents and family, saying they expected the field to be bombed. My grandmother would then take her two youngest children to spend the night at Mattishall Heath with her parents, the Nortons. Grandfather Bingham refused to move for the Kaiser and stayed put with the older members of the family (he later refused to move out for Hitler during the Second World War); and, nearby, the Allendons of Burgh Farm, made an air-raid shelter using a hay knife to cut a L-shaped tunnel in their haystack. At least, they kept warm during alerts. Several tall trees lined the road from Tollgate Farm to East Tuddenham and were sawn down, the branches lopped off, and left by the roadside. These made a good grandstand for the hundreds of people who came from miles around on a Sunday to watch activities at the airfield, hoping to catch glimpse of the planes taking off or landing. The tops of the trees were sawn and taken home by villagers on wheelbarrows and carts to be used for fire-wood. The tree stumps were left and made good seats for spectators. At the airfield, there were regular training flights made between Mattishall and Marham. New pilots followed the Dereham-King's Lynn railway from Dereham to Marham and returned by following the railway lines from Marham to Dereham and then Mattishall Church (a good landmark in the distance). Wind direction was indicated by smoke from a fire kept alight all day that was positioned at the end of the field, down Blind Lane. The bonfire was later replaced by a tethered balloon and later still, by a windsock, in the same position. My grandmother turned the farmhouse kitchen into a canteen, helped by Private Clamp and Private Deeye. They fitted shelving on the wall and did other work. In appreciation of this help she made special buns with a hollow in the centre filled with a spoonful of jam. These she called Deeye buns and they became very popular. She sold biscuits five for a penny (240 pennies to a pound in those days), buns, cakes and sandwiches. One day, an airman asked for Welsh rarebit and my grandmother had never heard of this. When it was explained to her what it was the airman always had his cheese on toast on request. Milk and butter were produced on the farm. Cigarettes and pipe tobacco were also sold, with Gold Flake being the favourite. The airmen got on well with the local population and held Sports days on the field in summer and Concerts in one of the long huts in the winter. The locals attended these by purchase of tickets, the money going to the Benevolent Fund of the day. On dark nights, when Beatty Basey was working late in the cookhouse the airmen used a small portable searchlight to show Beatty the way home up the hill into East Tuddenham. The searchlight was also used to guide the last wagon load of corn at the end of a long day from the top of the Big Field opposite into the Tollgate stackyard, much to the delight of the hold-gee boy on the horse (my uncle Geoffrey). The German Zeppelins now found they didn't have it all their own way. One was seen limping home over the field, low, slow and badly damaged. Later, it came down in the North Sea. All the base's aircraft were airborne at the time. Sometimes, the aircraft were in the air two or three hours; and in the wintertime, their open cockpits were very cold and the pilots had to be lifted out of their planes by the ground crew after returning from a patrol. The last attempted raid by the Germans was in August 1918, when four Zeppelins, waiting for night to fall, were seen hovering 30 miles off the coast of Norfolk by the crew of a Lightship. The Lightship radioed the information to the Yarmouth airfield and thirteen fighters took off in the gathering darkness, armed with the latest British invention, incendiary ammunition. Major Egbert and Captain Leckie located the Zeppelin L-70 and attacked with their incendiary bullets. The Zeppelin ignited and plunged into the sea, a blazing wreck. There were no survivors. The Home Defence Line had defeated the Zeppelins and the Mattishall-Tuddenham Airfield had played its part. Ironically, about this time the airfield had been supplied with an anti-aircraft gun, which was sighted behind the Tollgate. This gun was never fired in anger. Eight months after the last attempted raid, the Armistice was signed and the First World War was over. Two of the giant German airships, L-64 and L-71 flew around Norwich during daylight, and were seen from Mattishall before flying on to Pulham Airship Station where they surrendered in accordance with the Armistice Agreement. The L-71, the last Zeppelin built for war purposes, was 743 feet in length, armed with ten machine guns, and was capable of carrying a 5 ton bomb load. The end of the Great War saw the demise of Mattishall Airfield. The airmen were soon demobbed and only three soldiers were left to guard the Field and its equipment. This was a boring job for the soldiers but one day rapid firing from a machine gun was heard in the village and it is assumed the soldiers had found something to do to occupy their time. A large auction was arranged and all huts and surplus equipment was sold. Some of the huts were used as village halls and others as farm e buildings. The only evidence of the airfield today is the two overgrown roadways, one leading to the old airfield and one into the farm paddock. 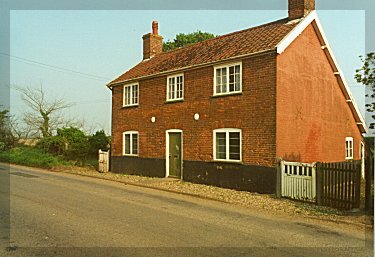 The small green Pay Hut where the airmen queued for their pay is still standing in its original position opposite the farmhouse. The footings of some of the airfield buildings are still there below ground and are avoided when the old airfield is ploughed every year. A 1939-45 Second World War Pill Box can easily be seen from halfway down Blind Lane. This appears to be guarding the old airfield. In 1940, a German plane dropped several bombs on the big field opposite the Tollgate, 200 yards away. Some bombs failed to explode and were dealt with by the Army bomb disposal squad. The road was closed at Mattishall and East Tuddenham and everyone had to be evacuated from nearby houses (while the squad made the bombs harmless) except Grandad Bingham who would not move and continued to dig his garden on the big field, 150 yards away, while the bombs were made safe. One American B24 bomber crashed in Mattishall in the last war (1944) down by the side of Blind Lane, within 300 yards of Lieut. Thunder's fatal crash. The B24 caught fire but eight of the crew escaped but unfortunately the pilot and co-pilot were burnt to death whilst strapped in their seats. ENGINEER SERVICES required at Aerodrome, Mattishall, Norfolk. For "A" Flight No. 51 H.D. Squadron, R.F.C. All timber to be sound well seasoned fir or spruce, or similar timber of good quality all to be subject of approval. Joinery work to be of good quality deals wrought and free from all loose bad knots, sap, shakes &c.
Framework of wallings, floorings and roofs to be of the sizes shown and with the timbers of the cantlings as figured on the plans. Concrete in foundations with screened ballast, pit gravel or shingle and sufficient sand to fill the interstices and in the proportion of 1 of cement to 6 of bulk of mixed dry aggregate. Provide all casing for concrete work above ground. Floors to be composed of approved clear porous material such as iron slag, hard burnt bricks, etc., broken to pass a 3/4" gauge with proper proportion of fine stuff and in the proportion of one part of cement to four parts of aggregate and when in position it is to be rammed with wooden beaters and steel trowelled to a fair and smooth surface. The tops of concrete bases to be weathered and floated to a fine surface. Doors, windows, frames and lourves to be knotted primed and stopped, and painted three coats of best oil colour finished to approved tints. All other woodwork externally exposed, underground, and plates bedded on concrete to have two coats of creosote. All corrugated sheet iron to be black dipped one coat of oxide paint at the works and painted externally one coat approved common colour. Steel ridging to roofs to be No.2 S.W.G. and painted as described for sheeting. The Contractor to inspect the Site before making his Estimate and allow for any inequalities in the site and removal of rubbish &c.
On completion of the work the Contractor is to remove all surplus soil and rubbish from the War Department premises. Walls to be constructed with the timber framing of the sizes shown upon drawing lined inside of Boiler House with No.22 S.W.G. corrugated sheet iron and painted as described for sheeting. Walls and roof of Bath Shed to be lined with match boarding wrought iron one side. The 4" x 3" sill plate to be bolted down with '/2" rag bolts at about 4' - 0" intervals. All floor and wall framing to be creosoted. Roof to be covered with corrugated sheet steel and sheet steel ridging. Form floor and channels in concrete laid to fall to channel all as shown upon drawing to be trowelled off to a smooth surface. Make good to gullies in channels. Form seats with 2" x 2" deal wrought legs and bearers and 2" wrought battens '/," apart for seating. Published by Derek Bingham Mattishall, Norfolk. In 1916, when the eyes of the world were witnessing the horrors of the Somme and the Western Front, a Norfolk village provided valuable service to assist Britain's war effort. Positioned in the centre of the Home Defence Line, the airfield at Mattishall and East Tuddenham provided fighter aircraft to combat a new, frightening menace - the German Zeppelin. Flying over Norfolk and the eastern counties of England, bombing at will, the huge airships terrorised the civilian population. These airborne monsters were over 600 feet long, could fly as high as 10,000 feet and were capable of carrying a large bomb load. In defence they were armed with machine guns, manned by highly-trained crews. Undeterred, the tiny aircraft of the RFC patrolled the night skies over Norfolk, frequently landing and taking off in total darkness. Climbing to operational height, the pilots sat in open cockpits in intense cold, probing the night skies for signs of the enemy. On their return to base they often had to be carried from their cockpits by their faithful ground-crews. Yet, in the months that they carried out operations against the German Zeppelins, their extreme courage and youthful daring finally defeated the airborne menace. Today, there are few signs to indicate the existence of their Norfolk airfield. Few people know of the heroic deeds and sacrifices of the pilots. This is an account of Mattishall during the years 1916-1919.